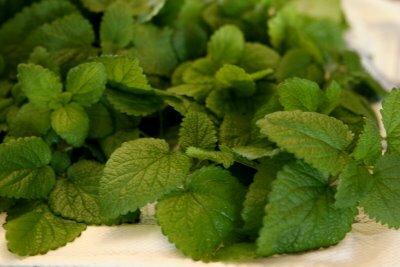 It is time to harvest the lemon balm and dry it for "meadow tea". It has grown prolifically this year. It seems that it loves receiving daily watering and is getting just the right amount of sun and shade. The lemon balm was planted about five years ago, and the established root structure appears to really be paying off. 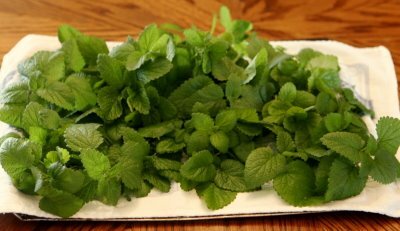 Lemon balm is a member of the mint family and has a lovely lemon scent. The heart-shaped leaves of this plant are shiny and wrinkled with scalloped edges. It's easy to grow, preferring a shady spot, although it will grow in full sun. This herb has tiny flowers of light blue or white during the late spring through midsummer. These blossoms are well loved by bees who seem to send out the word that this fragrant herb is in full bloom and there's enough fragrant nectar for all! I'll be laying the leaves of this herb on a paper-towel lined tray. Once dried, the leaves will crumble easily and will be useful for tea or potpourris. If drying a quantity of this herb, bundling and hanging is another useful method of dehydration. According to herbalists, lemon balm is a medicinal herb that has a variety of properties. It has mild sedative properties and is known to relieve gas, reduce fever, ad increase perspiration. Extracts of the lemon balm leaves have also been shown to have strong antibacterial and antiviral qualities. And, it is always excellent as an ingredient in herbal teas! We have a bush of something that looks like this that just grows on it's own by our shop. We thought it might be mint but it has a lemony smell so I'm thinking my mystery has been solved!! I am terrible about planting herbs and getting the mixed up! I enjoyed my visit here - hopefully learned about Lemon Balm! And it smells so heavenly. I haven't grown any for a few years now. Must write it down on my garden wish list. I thought when you said you had a good crop this year, well it is mint and mint can take over the garden. Oh but the smell must be delicious. Enjoy! I planted one small lemon balm plant next to the water spout by my house and it flourished this year in spite of the drought that affected my herb garden. I think I will plant another close to it next spring. I love it just for tea but it was recommended for my husband who is bipolar.